Father Peter Farrington travelled down to Glastonbury on Friday, 19th August. In the past the British Orthodox diocese of the Coptic Orthodox Church had celebrated occasional liturgies there. One of the members of the Church, Subdeacon Wulfric Ashdown, had organised with Father Peter, a series of events on Friday evening and Saturday morning. On Friday evening, after meeting Subdeacon Wulric, and Dr. Tim Hopkinson-Ball, an author, academic and the archivist of Downside Abbey, Father Peter attended a series of public lectures which had been arranged to make use of the intention to celebrate the liturgy. These were very interesting indeed. 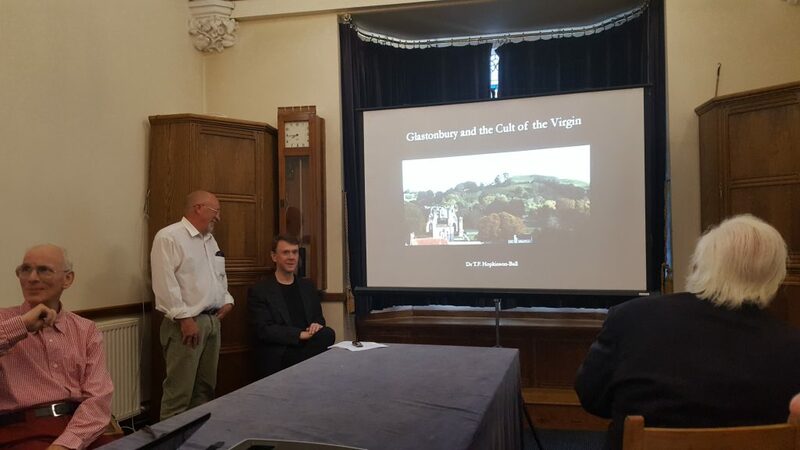 Dr. Tim Hopkinson-Ball gave an illustrated presentation about the veneration of the Virgin St Mary at Glastonbury from the earliest times, while Subdeacon Wulfric gave an equally interesting illustrated talk about the Coptic Orthodox Church, and the cultural continuity in Egypt from past millenia. The audience were very appreciative of the presentations, and during the evening Father Peter was engaged in conversation about Orthodox spirituality and spoke about union with God in the heart, about unceasing prayer and the acquisition of the Holy Spirit, and the Gospel of God’s love. There is a real interest among British people in our Orthodox life if it is indeed presented as life and love, and not as a religion and a law. On Saturday morning Father Peter met Subdeacon Wulfric at the ancient Abbey gates, and they prepared the Lady Chapel for the liturgy which was to follow. This was the first celebration of the Coptic Orthodox Liturgy of St Basil in this sacred place, dedicated to the Virgin St Mary for more than 1500 years. The service of the Raising of Incense was prayed as local people started to gather, including the Doxologies to the Virgin Mary and for the Feast of the Transfiguration. Then the Liturgy of St Basil was celebrated. Father Peter and Subdeacon Wulfric had not prayed the Liturgy of St Basil together before, but the service was conducted perfectly, and in a wonderful atmosphere of spiritual peace, as was appropriate in a place hallowed by almost 2000 years of prayer. The congregation was made up of local British people, from a variety of backgrounds, who enjoyed the service and received the blessed bread afterwards. Many of those present had been in attendance at the lectures the previous evening. Those who had discussed Orthodox spirituality with Father Peter in the evening had made a point of attending the Liturgy. This will be the first of an occasional but regular celebration of the Coptic Orthodox Liturgy of St Basil at Glastonbury, with an evening of presentations on suitable themes. Subdeacon Wulfric is to be commended for the effort he made in organising this event and its success is due in no small part to his organising activity.